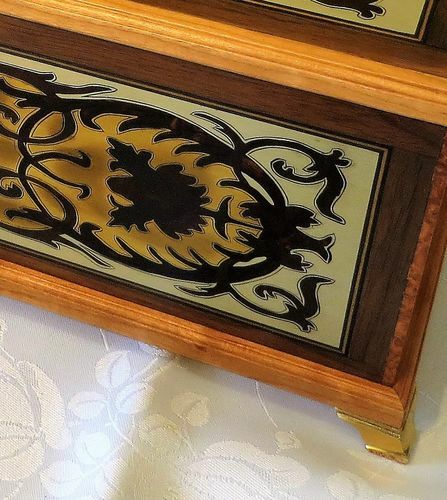 This is the first of my Boulle style marquetry boxes. The marquetry panels for this and the three others where produced by stack cutting a sandwich of materials on a chevalat. With the parts interchanged you get as many different color combinations of the design as there are materials in the stack. This one has an ‘ebony’ and ‘tortoise shell’ background, with brass, pewter and jarrah details. The metal parts are engraved to add detail to the design. Cherry veneer is used for the interior with solid cherry for the removable trays, drawers, and edgings. It is lined with YSL blue goat skin. A true works of art! So very beautiful! You say “thanks for looking”, I say thank you so much for showing. The contrast of the colors with the lining in perfect harmony. fabulous box! Karen is less complicated inside than the other three having fewer drawers and deeper trays. This shows the ‘bloom’ on the brass on Mattie, but I don’t plan to re-finish her – well not yet. My own preferences out of the four boxes are …............. 1st Charlotte, and a very close run thing to 2. Karen, then 3rd Mattie, and 4th Martha. Both are in premier partie , a light design in a dark background. As such they were the most valuable in Boulles day. Mattie and Martha are in Contra partie a dark pattern in a light back ground. Oh and by the way the ‘ebony’ isn’t ebony, but dyed black veneer, and the ‘tortoise shell’ or turtle shell which Boulle would have used is a plastic replica purchased from a luthier supplier.